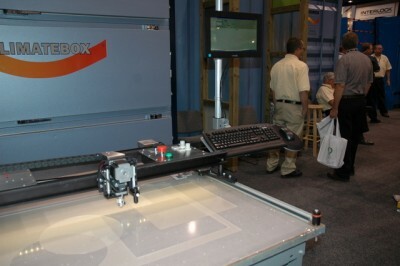 September 2010, Carlson Design exhibited in the Salem booth for the Glass Build America Trade Show. Carlson Design has been working with Tristar glass to create the ultimate just-in-time interlayer cutter for glass lamination. Glass lamination is used to make safety glass, colored glass, decorative glass, and specialty artistic glass. There are a variety of laminates (glues) that are “cooked” between two layers. These laminates are expensive and often temperamental, requiring a clean work environment and handling with gloves. These laminates typically need to be cut in multiple, identical layers and large sizes. using the Carlson Design plotter/cutter you can quickly cut very accurate, repeatable parts, nest them for material optimization and reduce laminate waste by 10-15%. This material savings alone will pay for the machine in the first year. Learn more reading Tristar’s Success Story. We added the light -- Vegas Baby!! 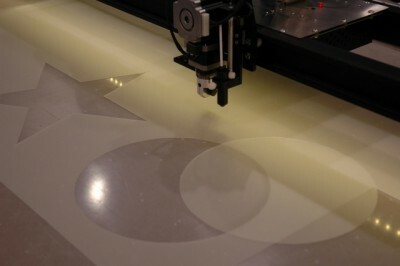 Very hard to cut shapes by hand - cut fast and easy with Carlson. 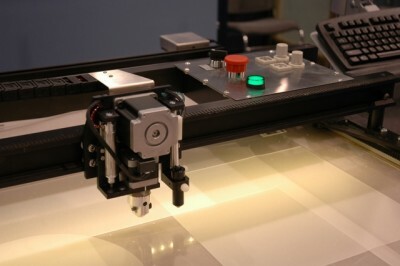 T-bar digitizer for digitizing specialty glass patterns. 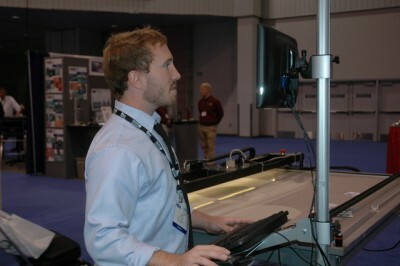 Robert Carlson Operating Plotter From Operator's Work Station. We had a lot of interest in our system at the GBA show and are looking forward to working with new glass lamination companies. 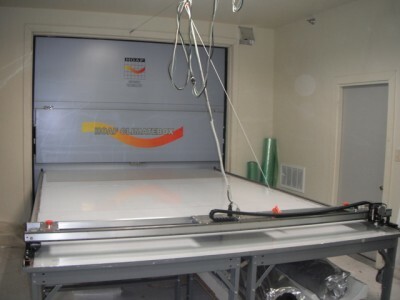 If you are interested in learning more about glass lamination, please let us know — we would be excited to share the lessons we’ve learned and our excellent time and material saving product. Many, many thanks to Salem and Doug Mangus who helped make this show possible. We’re looking forward to the next GBA in Atlanta.